"Helga Nowotny's exploration of the forms and meaning of time in contemporary life is panoramic without in any way partaking of the blandness of a survey. From the artificial time of the scientific laboratory to the distinctively modern yearning for one’s own time, she regards every topic in this wide-ranging book from a fresh angle of vision, one which reveals unsuspected affinities between the bravest, newest worlds of global technology and the most ancient worlds of myth." 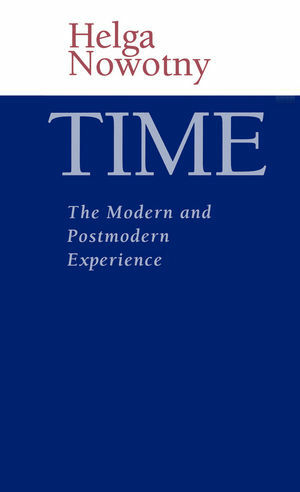 This book represents a major contribution to the understanding of time, giving particular attention to time in relation to modernity. The development of industrialism, the author points out, was based upon a linear and abstract conception of time. Today we see that form of production, and the social institutions associated with it, supplanted by flexible specialization and just-in-time production systems. New information and communication technologies have made a fundamental impact here. But what does all this mean for temporal regimes? How can we understand the transformation of time and space involved in the bewildering variety of options on offer in a postmodern world? The author provides an incisive analysis of the temporal implications of modern communication. She considers the implications of worldwide simultaneous experience, made possible by satellite technologies, and considers the reorganization of time involved in the continuous technological innovation that marks our era. In this puzzling universe of action, how does one achieve a 'time of one's own'? The discovery of a specific time perspective centred in the individual, she shows, expresses a yearning for forms of experience that are subversive of established institutional patterns. This brilliant study, became a classic in Germany, will be of interest to students and professionals working in the areas of social theory, sociology, politics and anthropology. Helga Nowotny is Professor at the Institute for theory and Social Studies of Science at the University of Vienna and during the summer term is Professor for Social Studies of Science at the Swiss Federal Institute of Technology (ETH), Zurich. Foreword by J. T. Fraser. 1. The Illusion of Simultaneity. 2. From the Future to the Extended Present. 3. Cronos's Fear of the New Age. 4. Politics of Time: The Distribution of Work and Time. 5. The Longing for the Moment. This brilliant study has already become a classic in Germany.